Locally farm raised, 100% natural, fed non-GMO grain, no antibiotics, no hormones. 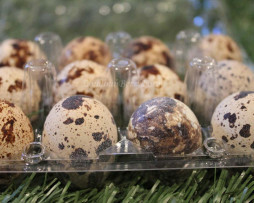 Our quail eggs come from our Jumbo Brown Japanese Quail that receive adequate space, nutritious Non-GMO food, clean water, proper lighting and fresh air every day. We have eggs for sale on an ongoing basis. Available April – October – Local Pick-up Only! Please contact us if you are a store, restaurant, school or business interested in retailing our Quail Eggs. We are the local source for Fresh Quail Eggs for sale in the Washington–Arlington–Alexandria, DC–VA–MD–WV metropolitan area! Looking for Japanese Quail Hatching Eggs? Locally farm raised, 100% natural, fed non-GMO grain, no antibiotics, no hormones. Our quail eggs come from our Jumbo Brown Japanese Quail that receive adequate space, nutritious food, clean water, proper lighting and fresh air every day. We have eggs for sale on an ongoing basis. 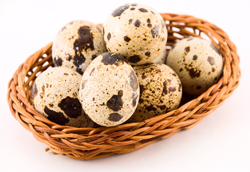 Looking for Non-GMO Fed Fresh Quail Eggs?